Definition at line 46 of file network-monitor-impl-osx.hpp. Definition at line 105 of file network-monitor-impl-osx.cpp. Definition at line 149 of file network-monitor-impl-osx.cpp. Definition at line 54 of file network-monitor-impl-osx.hpp. 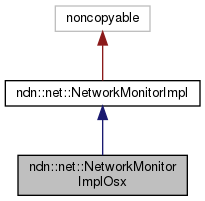 References ndn::net::NetworkMonitor::CAP_ADDR_ADD_REMOVE, ndn::net::NetworkMonitor::CAP_ENUM, ndn::net::NetworkMonitor::CAP_IF_ADD_REMOVE, and ndn::net::NetworkMonitor::CAP_STATE_CHANGE. Definition at line 158 of file network-monitor-impl-osx.cpp. Definition at line 165 of file network-monitor-impl-osx.cpp.